After its acquisition of 49% of Erik Buell Racing, there was little reason left to doubt the intentions of the world’s largest two-wheel manufacturer. We are speaking about Hero MotoCorp (not Honda), and its aggressive development of cutting-edge motorcycles, as reflected in the Hastuer 620 concept, as well as the HX250R, which is entering production this year. This is a photo of Markus Braunsperger, who has been with BMW for more than 25 years. In addition to a stint as head of R&D for BMW Motorcycles, Braunsperger designed flagship BMW automobiles. He is taking his expertise in development of new BMW models to India as the recently hired head of R&D for Hero. You can trust that, together with input from EBR, Braunsperger’s expertise will lead Hero in its development of larger displacement, higher performance models for both Indian and foreign markets (including the U.S.). EBR, which recently announced it has signed up more than 60 U.S. dealers, and partnered with Parts Unlimited for OEM parts distribution, will undoubtedly help Hero as it develops a distribution network for its products here in the U.S. 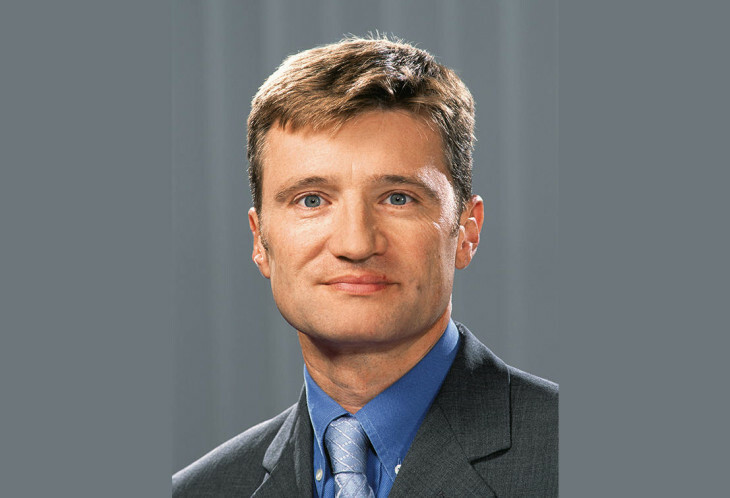 Hero MotoCorp has appointed hot-shot automobile designer Dr. Markus Braunsperger from BMW, Germany as the Head of its R&D division. A die-hard bike racer, Markus held numerous senior roles in R&D, production and strategy and headed the entire R&D function for BMW Motorcycles for several years. Significantly, he was also responsible for project management for BMW’s key product lines such as the 5/6/7 series as well as X3, X5 and X7 models. Braunsperger has been hand-picked by Hero Vice Chairman Pawan Munjal and will report into him. Munjal was also instrumental in hiring Markus Feichtner last year from the globally-renowned engine specialists, Austrian firm AVL to lead the “Engine Design & Development” division within Hero’s R&D function. Braunsperger will join Hero in the first week of October and will take complete charge of the company’s design and development of new products. He is expected to bring a lot of synergy between all of Hero’s technology partners – Erik Buell Racing (EBR) of the US, Engines Engineering of Italy and AVL of Austria. Hero, which holds 49.2 per cent stake in EBR, will be launching the first of its completely new products – the HX 250R and the hybrid scooter Leap in the second half of this financial year, and Markus is expected to keep up the momentum charting out the future line-up of new products. He will lead the 500-strong team of engineers at Hero’s R&D function. The market leader also last year brought in. This team is going to be based out of the upcoming “Hero Centre for Global Innovation and Research & Design” at Kukas near Jaipur. Hero has already developed three new engines to be fitted into its new products – 100cc, 110cc and 250cc engines. The 250cc engine will come in the form of the new Hero HX250R, expected to hit Indian roads in the second half of this fiscal. The 100cc and 110cc engines –with higher fuel efficiency and better overall performance – are likely to be fitted in the new commuter range of bikes that Hero is planning to launch. Norm…….there is a job at Hero working remotely posting nonsense about the their competitors and products……a perfect fit for you! i turned it down, pay and benefits were sh!te. Haaaaaaaaaaa….yea right Norm……in your mind, you turned down an offer from HeroCorp…….the same HeroCorp with accomplishments stated below in HEROCORP FINANCIALS!!!!! The reality Norm is you have no data or statistics to backup the nonsense you posted below related to this article and should admit it or show everyone here your credible backup source(s). Just one specific q for Norms world …….just how many design, production, assembly, test and new product engineers do you think it would take for a company like Hero to successfully produce 6 million motorcycles a year! The company has sold over 47 million 2-wheelers since its inception in 1984 till March 2013. It sold 6.07 million 2-wheelers in 2012, out of which 5.5 million were motorcycles. The company has a stated aim of achieving revenues of $10 billion and volumes of 10 million two-wheelers by 2016–17. In addition, to cope with the new demand over the coming half decade, the company will add two new factories with their fourth factory in Neemrana in Rajasthan while their fifth factory is planned to be set up at Halol in Gujarat. This is exciting news. I predict that we will see motorcycles that work well for the consumer. Motorcycles that are well thought out and that are a good value for the dollar spent. Motorcycles that are designed to be ridden for the long haul. When was the last time you went to a motorcycle store for parts and they actually had what you needed in stock. Parts distributed through Parts Unlimited is very innovative. It would be interesting to know how much Markus was involved in the BMW i8. Hero electric in the mix? Day one: “Erik, you’re front brake sideshow has been nixxed”. Your ignorance about the advantages of the patented Zero Torsion Load front brake is a sad commentary on you, not on Erik Buell. In case you had missed it, now that Buell’s patent has expired, you’re seeing mufflers under the center of many sport bikes. The male slider (“upside-down”) forks that Buell first debuted on a street bike are now commonplace on all brands. The mass centralization concept that has been a key part of the Buell design philosophy is now commonplace on other bikes. Like Buell, BMW has a history of innovative, non-traditional engineering, such as the first modern sliding forks, Paralever, Telelever, and Duolever suspension. They are the only company producing an oppoosed (boxer) twin line of engines. So it’s probably going to be a very good fit. Regardless of what their calculations say on paper, I’ve yet to find an example that works as well as a dual disc setup. Of course, there are already decades of development behind traditional brakes. The fact that the ZTL works as well as it does in its infant stages is no small feat at all. Given enough time, they may indeed get there. ZTL brakes are not designed to be better brakes. They exist to reduce unsprung mass, thereby improving handling and suspension performance. By moving the disc attachment points to the rim, the spokes and hub don’t have to carry a torsional load and, thus, can be made much lighter. It cuts in half the amount of brake hardware, thus reducing unsprung mass. I found, on my 1125CR, that just changing to an aftermarket pad eliminated my complaints about the brakes being non-linear and grabby. Yes, I am aware of the design goals. What I am saying is that I can’t really tell any benefit from the lighter wheel assembly, but I can tell the difference in braking performance that a good dual disc setup offers over the ZTL. The new EBR bikes might be a completely different story with the brake-cooling ducts and what looks like the lightest alloy wheels made. Funny to me that there are still detractors to the single. Disc concept (?) On the Buells. Doesn’t it occur to anybody how few vehicle types require/use more than one set of brake components per wheel? I think the only reason it hasn’t yet erased dual disk is that Buell has been the only one developing it. As I said, the ZTL is still at the infant stages in its development, and as you said, there is only one company bothering to develop it. 10 years from now, it may be the norm. The 1908 450cc two-stroke twin Scott had male slider forks, under engine exhaust and zero torsion load brakes! I’ve got 2 Buells with ZTL and they work very well. I really prefer them to the brakes on my RC51 but I realize that bike is 10 years old. What isn’t mentioned is the ease of bleeding a single disc which has/should be done every 2 years, one set of pads, ease of checking tire pressure. I hope the ZTLs stay and for everyone of us non Valentinos, they work better than the rider. If you want to get technical, Moto Guzzi debuted mail slider forks on a street/production bike back in the late 1940s. Great innovation on EB’s behalf no doubt, but see ya lat front brake sideshow. Other leading brake manufacturers have done the same R&D and guess what, it’s advantages are offset by its disadvantages. I hope you are correct Ty. The brake manufacturer makes the product the motorcycle companies ask them to. Connecting the disc to the center of the wheel is easy to control (easier to ensure the rotor runs true, makes for cheaper wheels, easier to mix/match parts across platforms) for mass production. Lots of choices are more about what’s better for production than what the optimum solution for a specific bike may be. So here we are seeing one of the most exciting corporate motorcycle formations in Hero for decades……. and your perspective is to complain about Eric Buells front brake design. Ty ……and yes this is a very formal request for you to reply with a list of all your innovative motorcycle and parts designs to get a seat at the table with Eric Buell and a few others…….. as the most important “individuals” in motorcycle history. Ty & I are not complaining about the brakes, only commenting on the possibility that they’ll now probably be corrected by the exciting addition of this German to head R&D who probably won’t stand for sub-performance of an inferior design. I think this is great news! 1. Ty stated this: Day one: “Erik, you’re front brake sideshow has been nixxed”. Still waiting for your reply, but lets just leave it at this. Ty/Buckwheat have only one complaint/issue with Hero and Eric Buell ….so I guess both of you agree everything else Eric Buell has done in the past was not a failure…….if so we do agree!!!! Yeah, yuck, yuck, we’ll see who gets the last laugh. I’m sure they are doing in Europe what they are doing here in the U.S. as for as their dealer network goes. Sounds promising, and good on EBR, now finally freedom to dream. The experts here would have said the same thing about Honda back in the day. I was there way back then and heard the same thing all about Honda….and yes I said some of it, but all that changed a few months later when I got passed by a guy on a Hawk 250 while giving it a real go on my Goldstar. My first thought then was everything I knew about motorcycles had changed in those few seconds, yet the nay sayer experts then continued it for decades about bikes made in Japan……and some today are still at it even today!!! Didn’t know Conan was into motorcycles. This is how their bikes will look now – all square. I wonder if Honda is paying attention to all this? It could turn out to be nothing big, or, there could emerge a serious new player on the global motorcycle field that will be a real game changer. Time will tell. 500…? these guys must be getting paid in sea-shells. They work in American corporation call centers on their days off. Hero sells almost as many units per month as are sold annually in the US by all brands combined. I’m sure all 500 of those engineering jobs are coveted by engineering grads in India. Dave…please refrain from stating facts……it is far too confusing for the self proclaimed experts here! Norm…….there is a job at Hero working remotely posting nonsense about their competitors and products……a perfect fit for you! Norm………see my reply at the beginning of this series of posts. Yes indeed……facts are facts Norm……not hate. Try it every now and then. So how many product research and development, design, production, assembly, test engineers will it take in Norms world to produce 10 million motorcycles a few years from now! that or they use the term “engineer” loosely…? breaking news…! you don’t need 500 engineers to build 3rd world motorbikes, although you might employ 500 “laborers” across various factories to put “bolt A” into “slot B”, sweep floors, shuffle papers, push pencils, and make sure the coffee pot gets a regular cleaning. put on your thinking caps fellas, if you actually HAD 500 engineers earning a wage commensurate with their degree, then you’re doing something wrong if you need to then headhunt OUTSIDE talent like Braunsperger and Feichtner (and rest assured THOSE guys aren’t getting paid in Rupees). you’d have a payroll in the $TENS of millions and this BEFORE the Europeans even came on board. sure, if you were in GLOBAL CAR WORLD you’d be able to sustain a payroll like that, but you’re not doing it on motorbikes. Honda and Yamaha’s MOTOGP programs COMBINED don’t employee 500 people…? and they inarguably create sophisticated machines that punch through double ton, and cost 3 and 5 million dollars a copy. Actually, you do. Hero produces *millions* of bikes, in their own factories. In addition to the engineers that design frames, transmissions, engines and whatever other parts they make themselves, you need engineers to design the production processes, engineers to design the tooling that make the parts the other engineers designed. It’s a bigger undertaking than it appears on the surface, could be why Harley still builds things as engineered in the 40’s. They each make 6 copies of a single motorcycle & engine. They’re custom made so no production line. They also use significant content from outside their own engineering umbrella (brakes, wheels, suspension, electronics) Cute bikes, but not the undertaking that mass production is.